Another unsung hero of the stunt profession is Bill Hart. And before anyone wonders out loud... No, he’s not related to cowboy great William S. Hart. Bill was born in Redoak, TX, (which is not even there anymore) in 1934. The population was a mere 85 souls near present day Paris, TX. Bill’s Mom and Dad died when he was very young but he finished his schooling at Edinburgh High School in south Texas. Work was sparse so Bill moved to California in 1958 to check out employment and colleges. The western television boom was in full swing at this time and Bill became interested in the film business as a way to make money for college. 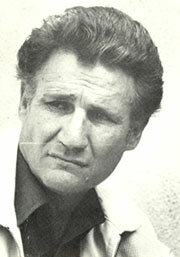 Bill’s future father-in-law, stuntman Chuck Roberson, took an interest in this tough Texas youngster and Bill was soon falling horses, doing fights and saddle falls on such western series as “Wanted Dead or Alive”, “Have Gun Will Travel”, “Gunsmoke” (some 40 episodes), “Cimarron Strip” and “Stagecoach West”, which was the first job Bill got to stunt co-ordinate. Bill’s expertise with a horse and his fight prowess stood him in good stead. He was hardly ever out of work and was finally cast as “Red”, a regular member of the “Stoney Burke” rodeo series starring Jack Lord (‘62-‘63). Bill also stunt coordinated this job. It was the beginning of a life long friendship with co-actor Warren Oates whom Bill doubled from then on. Bill spent three months in Del Rio, TX, on John Wayne’s “The Alamo”. In ‘68 Glenn Ford okayed Bill as his double on “Day of the Evil Gun” and no one doubled for Ford from then on. 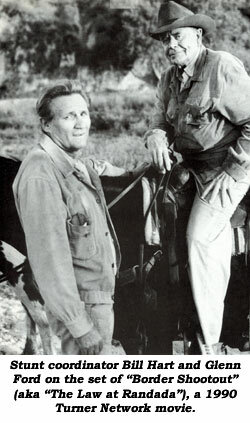 Bill was stunt coordinator on Glenn Ford’s action laden TV series, “Cade’s County” (‘71-’72) in which Bill utilized the talents of Dave Sharpe, Chuck Roberson, Boyd Morgan, Hal Needham and others. Some stunts are easy and some stunts are life threatening. Tough days were just around the corner for Bill Hart. He was hired by director Sam Peckinpah to be in Robert Ryan’s gang in the classic western, “The Wild Bunch”. Now that doesn’t sound too tough, does it? But as part of the assignment Bill and other stuntmen had to literally be blown sky high and ride their horses into a Mexican river from a bridge after it’s demolished by real dynamite. It’s without a doubt one of the most spectacular scenes ever attempted by our action actors. Bill tells me all went well except one horse drowned when a beam from the exploding bridge fell on its head. Bill has been involved with and coordinated such films as “Heroes Island”, “Glory”, “Sunset”, “Border Shootout” (w/ Glenn Ford), “Young Guns”, “Blind Date”, “North and South”, “The Fall Guy”, “Gambler II”, “Holy Matrimony”, “Under The Rainbow”, “Heaven’s Gate” and hundreds more. Bill was one of the charter members of the Stuntman’s Association when it was formed in ‘61 and, along with the late Henry Wills, was one of my main sponsors for membership into this prestigious group. Bill is considered an all around stuntman. He’s not only expert with livestock but also doing car turnovers, fire burns, fights and high falls. Bill’s son Chuck Hart is also a stuntman who worked in Texas on “Streets of Laredo” with James Garner. After reading this article, put on “The Wild Bunch” and watch one of the best stuntmen Hollywood has... in action.